1) Woking were founded in 1889, and would have folded in 1908 if not for an FA Cup run, culminating in a match against Bolton Wanderers, that helped keep the club afloat. 2) Woking won the FA Amateur Cup in 1958, beating Ilford 3-0 in front of a crowd of 71,000, in what was the last-ever Amateur Cup Final to be televised. 3) Woking's first ever relegation came in 1983, with the club relegated to Division 2 of the Isthmian League. Since then, Woking have only been relegated twice more, in 1985 and 2009. 4) In the 1990s, Woking won the FA Trophy three times: in 1994, beating Runcorn 2-1 in the final; in 1995, beating Kidderminster Harriers 2-1 in the final and in 1997, beating Dagenham & Redbridge 1-0 in the final. They also reached the semi-finals in 1980, and lost in the final in 2006, losing 2-0 to Grays Athletic. 5) Woking have progressed to the 1st Round of the FA Cup 29 times, doing so for the first time in 1908 (as mentioned above). Their best run saw them reach the 4th Round in the 1990/91 season, beating Bath City, Kidderminster Harriers, Merthyr Tydfil and West Bromwich Albion before losing 1-0 to Everton at Goodison Park. 6) Woking's highest-ever league finish came in the 1994/95 and 1995/96 seasons, when the club finished 2nd in English football's fifth-tier for two consecutive seasons. 7) Woking's record win was a 17-3 victory over Farnham Town in the Surrey Charity Shield in 1913, while their record defeat was a 16-0 loss to New Crusaders in the FA Cup in 1905. 8) The highest transfer fee paid by Woking was £60,000 for Crystal Palace's Chris Sharpling in 2001, while the highest transfer fee they have received was £150,000 from Fulham for Kevin Betsy in 1998. 9) Notable players to play for Woking include Harry Arter, Paris Cowan-Hall, Darryl Flahavan and Adriano Basso, among others. 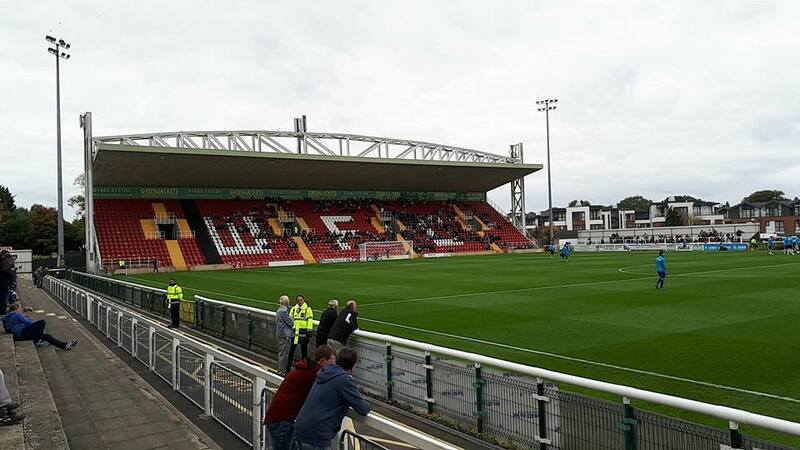 10) The record crowd to watch Woking at Kingfield Stadium so far is 7,020 for a game against Finchley in the FA Amateur Cup in 1958. For my 25th ground, I wanted to do something a little different and a little special compared to usual (my usual preference is Step 5 and Step 6, although I'm reasonably happy doing Step 3 and Step 4 as well). 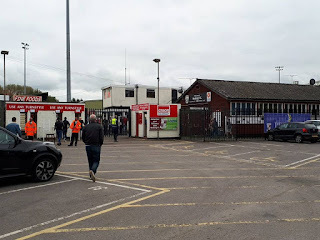 While I could have waited until Norwich's visit to Arsenal on the 24th of October, my visit to Guildford the previous weekend meant I didn't want to wait that long, so I decided to have a quick browse through the FA Cup games and see if any stood out. Upon doing so, I found this game and, upon seeing on their website that they only charge students £5, I decided that it was an offer I couldn't refuse. On the day of the game, I got the train to Woking (a quick 10 minute journey from Guildford) and walked over to the ground, getting there for 2:30pm (and walking past Westfield's ground, which I have since visited, while doing so). It was at this point that things went slightly awry, as it turned out the £5 advertised on their website was wrong, and it was actually £10 for me to get in. This was a problem because it meant I couldn't get a programme, as I had only budgeted to have £10 altogether (£5 for entry, £3 for a programme (or whatever it actually was) and the rest as spare for food or whatever else): stuff like this is why it annoys me when clubs advertise incorrect prices on their websites, or if they don't do so at all (is it really so hard to?). In any case, because I was flustered and annoyed by that situation, I was distracted and didn't do a circuit of photos, instead settling on the terrace on the far side and taking all my photos from there (you can see this terrace in a photo later on, a photo which isn't mine as I forgot to take one of that terrace myself). From the start, my expectations had been that Woking would dominate their Step 2 opponents, but in the first half this was absolutely not the case at all. Instead, as a chance for them within the first minute alluded to, Concord started the brighter against a Woking side who initially looked as if they didn't know what their game plan was. Of course, this isn't to say that Woking weren't creating chances - as the early stages of the game were proper end-to-end stuff - but they did not have the confidence of a side who are doing as well as they are in the National League. As such, it wasn't at all surprising when Concord took the lead on 34 minutes, a ball played into the box and finished in some style by Steve Cawley. What was surprising is that this goal did little to wake Woking up, and they were very lucky not to concede a second a few minutes later. In the second half, Woking came out like a completely different team - clearly the manager had given them the hairdryer treatment at half-time - and quickly took complete control of the tie, essentially pinning Concord into their own box with chance after chance after chance. However, as so often happens in the FA Cup when the underdog takes the lead, Concord defended with their lives, constantly getting men in front of most shots with the goalkeeper saving the rest. It was a valiant, excellent defensive effort that really deserved a clean sheet, but the sheer amount of chances Woking were creating meant that an equaliser was almost inevitable, and so it proved when a save was deflected into the path of Jamie Philpot on 87 minutes, who duly converted before the keeper could get back up again. Unsurprisingly, Woking then pushed hard to score a winner and came very close just two minutes later, a curled shot from 25 yards being saved in brilliant fashion (the best save I've seen in a long time, at the very least). However, in these final few minutes Concord had a couple of breakaways of their own, including one with the last kick of the game where Steve Cawley ended up with the ball in the box unmarked but smashed his shot into the post. Had Cawley scored for Concord there, it would have turned an already enjoyable cup tie into a special one, and not just because it would have been a major upset. Woking's Kingfield Stadium is an unusual one, a strange mix of a lower Football League and a traditional non-league ground: the main stand behind the far goal would not look out of place in the Football League at all (nor would the covered terrace behind the near goal, pictured above after Woking's late equaliser), while the smaller stands on the dugout side and the uncovered terrace I stood on were very much traditional non-league. The ground has an official capacity of 6,036, of which 2,500 is seated. 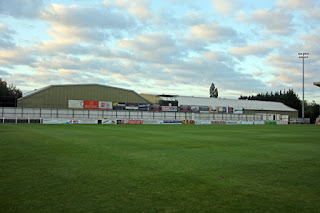 The ground was also used by Hayes & Yeading United from 2011-2014, and is around a mile away (or, for me, a walk of just under 20 minutes) from Woking train station. On the way to the ground, you also walk past Westfield's ground, assuming you go through Woking Park to get to Kingfield Stadium that is. Overall, despite my other issues with the day as a whole, I did enjoy the ground, as that strange mix of traditional non-league and lower Football League gives the ground a unique kind of charm that made it an enjoyable one to visit.